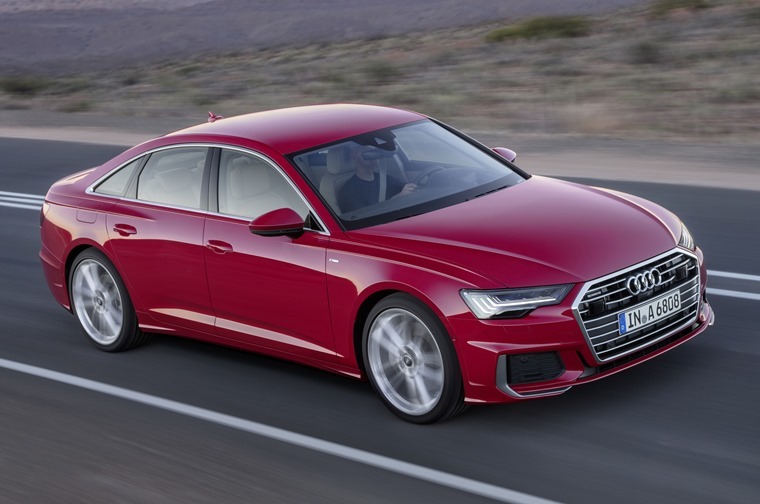 Audi has presented the eighth generation of its successful luxury sedan at the Geneva Motor Show. Conveying sporty elegance, cutting-edge technology and premium quality, it borrows styling and technology from the recently launched Audi A8 and is aiming to take on the latest BMW 5 Series when order books open in June. Externally, Audi’s trademark hexagonal grille is now present up front, as are sharper LED headlights that look very similar to those on the new A8. Range-topping models feature HD Matrix headlights. At the rear however, it doesn’t feature the full-width lighting arrangement that the A7 and A8 benefit from. Despite being slightly larger than the outgoing car, the A6 is lighter than ever before thanks to an aluminium-steel construction that’s also increased body rigidity. Its side profile is more coupe-like thanks to a swooping rear end and C-pillars which are flatter than before. 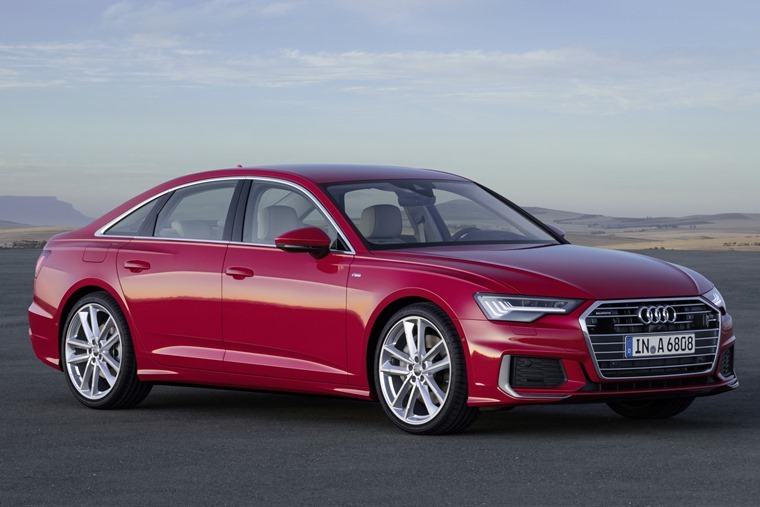 Audi says that this gives the A6 a sporty and elegant character and we have to agree on that point; it certainly looks more like a downsized A8 than an up-scaled A4. There’ll be a choice of 14 colours, along with alloy wheels that range from 17in to 21in. Those looking to add a sporty touch will be able to spec Audi’s S-Line kit, which adds a different set of bumpers and lowers the ride height by 10mm. Inside, the A8’s influence is even more noticeable. It gets the same MMI Touch control infotainment system which combines an 8in infotainment system with a 8.6in touch screen for climate control. The infotainment screen can also be specified as a 10.1in with the Navigation package. This will also add Audi’s clever Virtual Cockpit, which replaces traditional dials with a 12.3in display. It’s not just tech that’s been carried over either – the rest of the cabin gets the same premium materials as the A8. Other headline tech includes Audi’s latest self-driving driving system, which is in theory capable of Level 3 autonomy – although that’s not quite usable on UK roads just yet. 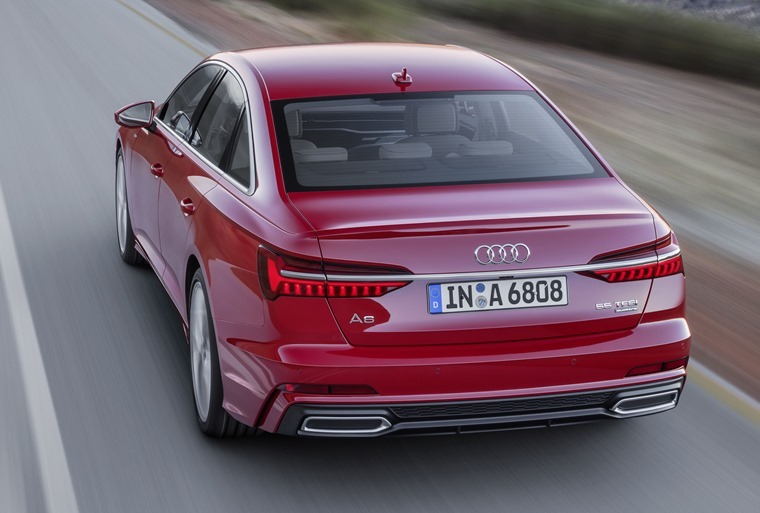 However, with five cameras, five radar detectors and 12 ultrasonic sensors, the A6 is more or less future-proofed for a few years as far as self-driving tech goes. From launch, four engines will be available – three diesels and a petrol. All of them feature Audi’s new mild-hybrid tech as standard, which will allow the car to ‘coast’ between 34 and 99mph. In real-world driving, this tech can save up to 4g/km of CO2. The range kicks off with a 201bhp 20-litre turbo diesel. Next up is a larger 3.0-litre V6 diesel available in two states of tune – 228bhp and 286bhp. The range is topped off by a 3.0-litre V6 petrol that makes 335bhp, although smaller petrols are likely to join the range after launch. No manual gearbox is available as all engines make use of Audi’s S-Tronic automatic transmissions. Among other options, dynamic all-wheel steering and an adaptive air suspension are available, which means the driver is able to select a wide spread of driving modes. Audi A6 will launch June 2018, with full specs and pricing for UK models TBC.